Happy spring to all our readers! We’ve got some great news to share with you today. 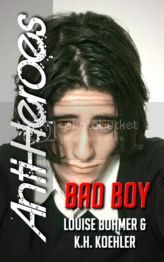 First off, now you can grab Anti-Heroes Book 1: New Girl for FREE at Barnes & Noble. Click the highlighted link here or the book cover below to download a copy to your Nook now. 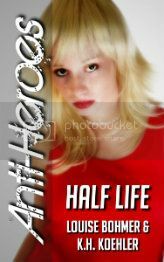 We thank you a ton for all the sales and making Anti-Heroes, our serial novel, a huge success! We’re both thrilled you’re enjoying your adventures with our supervillains so much. And don’t forget, you can grab Book 2, 3, and 4 now as well! Click on the book covers below to grab copies. Also, here’s more updates on what’s ahead for us from Ms. K.H. Koehler’s blog. Right now I’m down in the Mrs. McGillicuddy trenches, frantically finishing up An English Werewolf in New York, the third episode of the new Mrs. McGillicuddy Mystery series, and also juggling with finishing up Anti-Heroes with Louise Bohmer. In addition, my writing partner and I are working on developing a whole new gothic-centered New Adult series we hope to unveil very, very soon. It should begin roughly at the time we finish up Anti-Heroes, and it will center around college life and vampires, two of our favorite subjects! any publishers out there interested in releasing the paperback through their own imprint, and maybe taking a look at our next series, you’re welcomed to hit us up for the details anytime! So more Anti-Heroes goodness coming soon, plus a brand new series in the works! Be sure to visit the three sites for future updates!